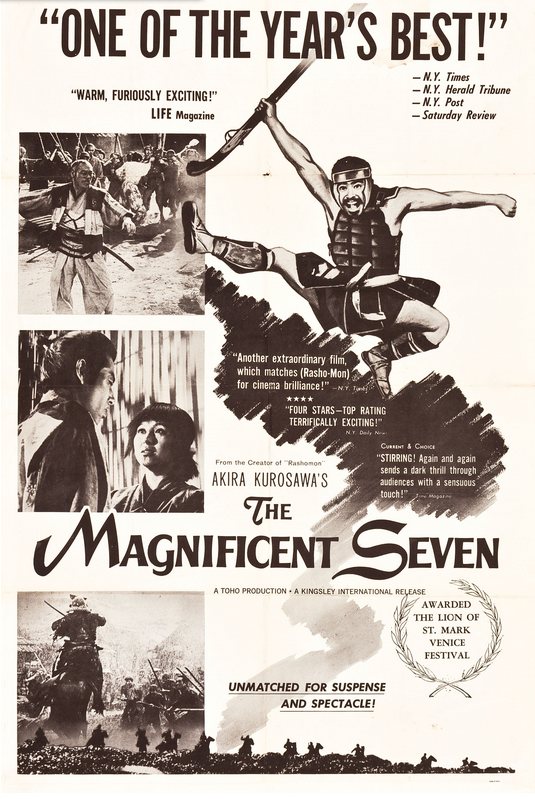 I am by no means sour on Antoine Fuqua’s The Magnificent Seven (2016) remake, and those that are have no real leg to stand on – unless they’re bitching about another pointless remake of Seven Samurai (1954). However, I did feel there was something sorely missing from the trailer. Not something your eyes missed, but your ears. What I’m saying is, gets some Elmer Bernstein or GTFO. Video courtesy of HD Film Tributes. 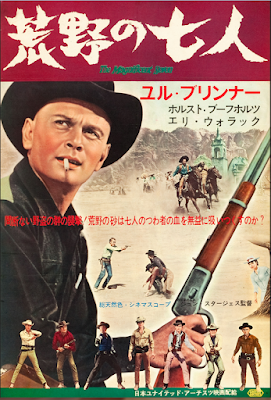 Can we all agree that Bernstein’s score is the one definitive thing where Sturges' film ran circles around Kurosawa? Even if you just can’t do that, you cannot deny how awesome and transcendent that music is. And the scary part, it almost wasn’t and was almost something completely different. Apparently, Dimitri Tiomkin was set to score the film but was fired when he and Sturges disagreed vehemently over the music for the opening credits. 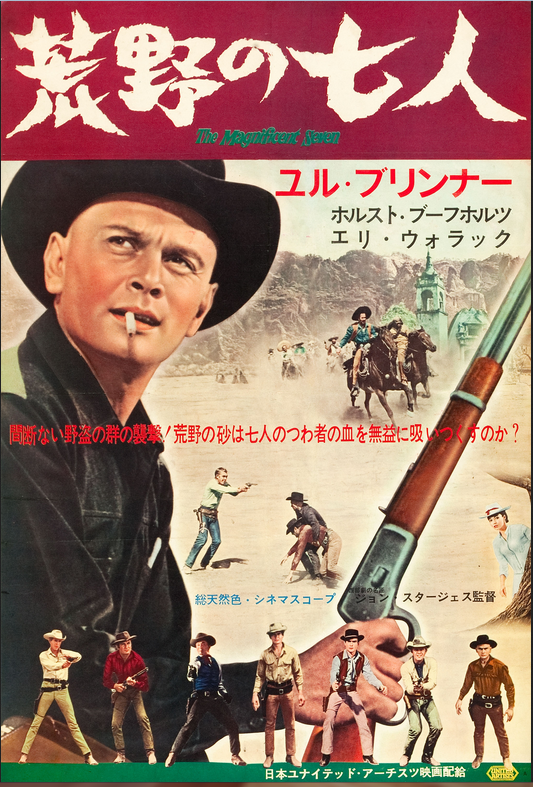 Seems Tiomkin wanted another ballad like he did with Frankie Lane for Gunfight at the O.K. 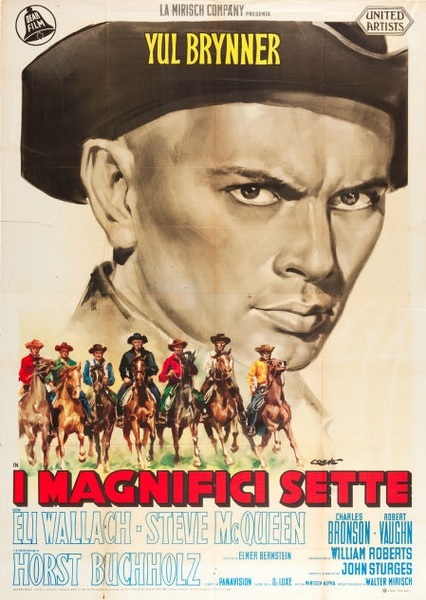 Corral (1957), perhaps like the one used for the trailer. (Or perhaps that was Tiomkin’s initial piece that was later rejected?) Go ahead, give that a listen, and now imagine that over the opening credits instead of that driving, horn heavy, buzz-sawing strings laden, and bombastic piece of awesome instead. Thus, Tiomkin, whose music I otherwise love, was dismissed and replaced with Bernstein. And Tiomkin’s loss was definitely our gain. 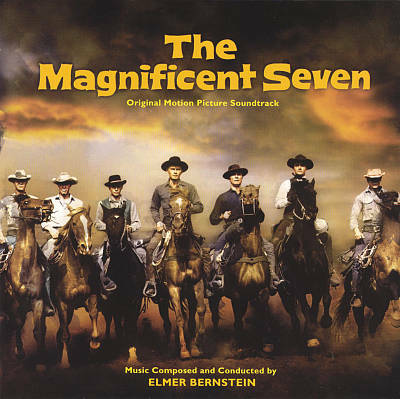 I’ve been listening to The Magnificent Seven soundtrack on Spotify a lot lately, all of it, and am constantly mesmerized by how well it all stitches together, with the main theme echoing through all of it. This score doesn’t just fly, it soars. Sure, that main theme was used and abused most horribly in the subsequent sequels, so much so that it almost became something akin to circus music – a clown car ditty that made your eyes roll. 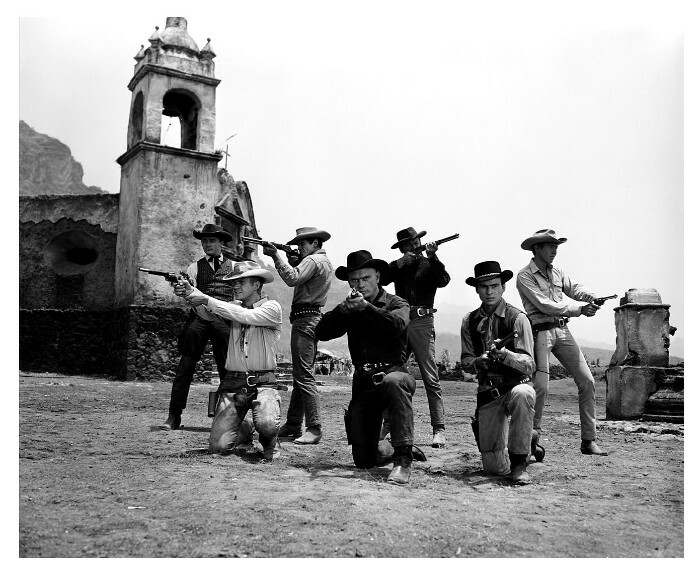 But it’s been almost fifty years since The Magnificent Seven Ride (1972) and nearly twenty since last used in the TV series spin-off, and I think it’s high time to take it out, polish it off, and give it another cinematic spin. And one last note before I go: if you enjoyed that music video, be sure to check out HD Film Tributes YouTube channel because he’s got a whole lot more soundtrack vids edited together and they’re all just as great as that one. We open in the thick of it as a bloody revolt erupts in and around the castle of Lord Ogata (Hayashi); the benevolent ruler of the feudal Japanese kingdom of Oumi. Well, at least he was until his top general, Yuki-daijo (Amatsu), reveals himself to be a traitor and the instigator of this violent uprising. who then puts a sword through his former master, killing him. And as Ogata's wife tries to escape, she is also killed by Orochimaru (Otomo); the ruthless leader of a band of mercenary ninjas, whom the corrupt Yuki-daijo hired as muscle to back this hostile takeover. Apparently a success, Orochimaru reports all other loyalists to Ogata have been liquidated, leaving only one loose end to wrap-up and snuff-out before Yuki-daijo officially takes over: Ogata’s young son and rightful heir, Ikazuki. But this is only the beginning of our tale, as we jump ahead several years and find a now much older Ikazuki (Matsukata) training hard in the art of ninjutsu and magics under the tutelage of a wizened old hermit named Dojin-Kiki (Kaneko), who had sent the eagle to save him. And after successfully completing the latest battery of hazardous tests and surviving the obstacle course from hell, Ikazuki is informed his training is now complete and it’s time to return to the outside world and embrace his destiny to do good for all of mankind, unlike Dojin-Kiki’s last pupil. But the revelation of who that was and what his destiny will be will have to wait until after dinner. Sent out to find some suitable veggies for the pot, Ikazuki is attacked by a pack of wily, preternatural ninjas. And while it appears this fight doesn’t go well for our hero, what with him getting decapitated and all, turns out losing his head put his opponents right where Ikazuki wanted them. (No, I am not making this up.) Soon vanquished, the last remaining ninja suicides-out before revealing who sent them. Once he gets his head back on, Ikazuki also flushes out Sonate (Ogawa), thinking the young maiden is another attacker (-- well, at least he did until accidentally cupping a feel and realizing she's a girl after tackling her and going for a downhill roll in the weeds). Turns out she was just lost in the woods, searching for her equally long lost father since her mother recently died. Thinking his master may be able to help find him, since she claims her father came to this area to study with a wizard, a smitten Ikazuki convinces the girl to come with him. Meanwhile, Orochimaru drops in on Dojin-Kiki. (Obviously those ninja assassins were his, out and about trying to find and kill the missing prince.) Turns out there’s a long and sordid history between these two. And, yep, Orochimaru was the former (and now disgraced) pupil of the old wizard, who stole several magic scrolls, including the one with the instructions on how to morph into a dragon. Seems Orochimaru finally realized it must have been his old master who saved Ikazuki; the delay was due to his thinking the old wizard was long dead, since the villain thought he had killed him while stealing those scrolls. You know, it’s not very often in a film where your hero gets his own head lopped off but still manages to win the fight against a horde of killer ninjas anyway. Ladies and Gentlemen, Boils and Ghouls, welcome to the pure bonkers-bedlam of Tetsuya Yamauchi’s The Magic Serpent (1966). Gleaned from Japanese folklore, the film was based on the legend of Jiraiya (-- later changed to Ikazuchi-Maru), a master ninja who controls “giant toad magic," where he rides around on some over-sized amphibians, fighting evil, and can even turn into a kaiju-croaker whenever the situation calls for it. And in his serialized adventures he falls in love with Sonate, a beautiful maiden, who is a master of “slug magic," and has a running fight with his dreaded arch-enemy, Orochimaru, a former pupil who controls “giant serpent magic." The first recordings of these stories can be dated back to 1806. From there it was expanded to 43 installments between 1839 and 1868, with the first ten chapters adapted by Mokuami Kawatake into stage production, Jiraiya Gōketsu Monogatari [“The Tale of the Gallant Jiraiya”] around 1852. And it was Kawatake’s version producer Shigeru Okada and Toei Studios adapted into Kairyū Daikessen [“The Mystic Dragons’ Decisive Battle”] nearly a century later. 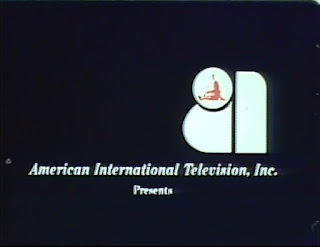 Founded in 1938, Toei most notably dealt with product for television aimed at children; and whether it be animated (Mazinger Z, Voltron, Dragon Ball Z and Sailor Moon) or live action (Johnny Sokko and His Flying Robot, Kamen Rider, the completely demented Supaidāman, and then there’s the Power Rangers and their assorted knock-offs, Big Bad Beetleborgs and Masked Rider), one cannot underestimate the cultural impact their product had on both sides of the Pacific. Hell, globally. Essentially, if it had a kid and a giant robot, or a bunch of kids forming a giant robot, beating the snot out of a horde of goofy-assed monsters, it probably had Toei’s fingerprints on it. 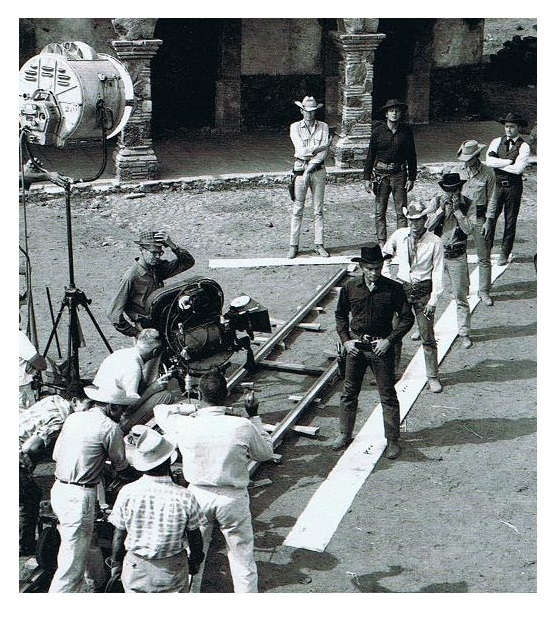 Thus, Toei wasn’t averse to making tokusatsu [“special filming”], a catch-all Japanese term for anything featuring live-action and the considerable use of special effects -- even on the big screen. It began when they cobbled together several episodes of their Planet Prince series into a feature, which was then exported to the States as Prince of Space in 1962. 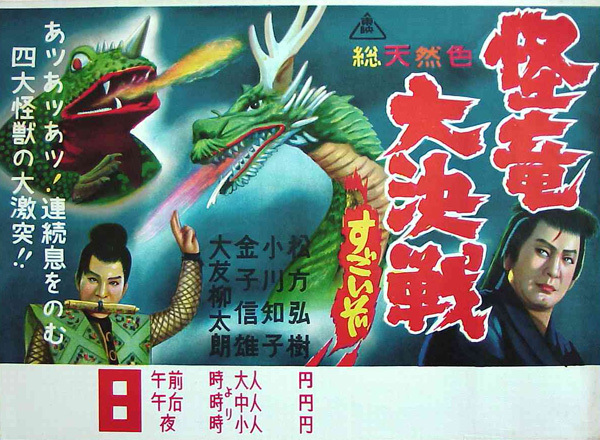 This was followed up by Invasion of the Neptune Men (1961), and another Sonny Chiba vehicle directed by Kinji Fukasaku, The Terror Beneath the Sea (1966), a wild mash-up of spy-shenanigans and mad science. Fukasaku would also helm The Green Slime (1968), which Toei co-produced with MGM, that I really need to get around to reviewing one of these days because it is that awesome and then some; and let us not forget Toei’s Star Wars cash-in, Message From Space (1978), which, sticking with the theme, is totally nucking futz that I go into much more detail here for those who want to get their hands on their very own magical space walnut. Anyways, circling back to The Magic Serpent, it, too, was imported to the States by American International Pictures but it didn’t get a theatrical release. 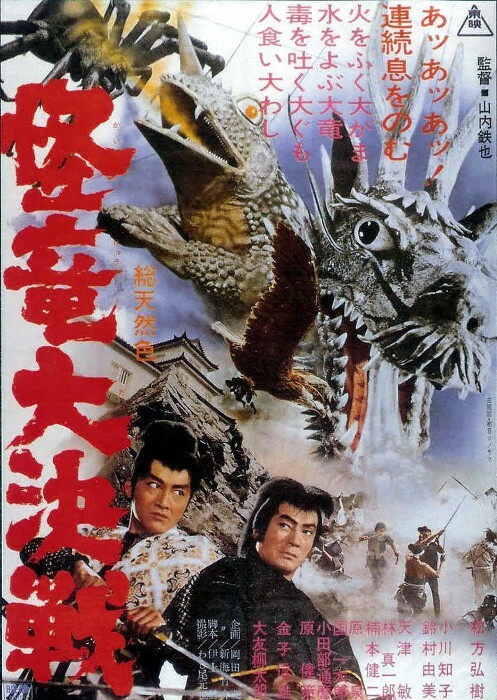 Instead, it was packaged-off as part of AIP’s syndicated TV line-up with other Japanese imports like Toho’s Dogora (1964), The X From Outer Space (1967), Yongary (1967) and Daiei’s Daimajin trilogy and nearly all of their Gamera films. Here, the film was given a new and extremely nonsensical title, was extensively re-cut, re-scored, and dubbed over by the always commendable Titan Studios, who also dubbed Speed Racer and Ultraman among many other imports ranging from Gamera to Gamma-3. Even the monsters were dubbed, with the familiar roars of Godzilla (the dragon), Rodan (the toad), and Mothra (the eagle) all subbing in for an assortment of creatures. But even with all that tinkering, nothing can or ever will quash the pure and unadulterated fun The Magic Serpent brings from start to finish. Meanwhile, Yuki-daijo leads a contingent of troops to the local market where Ikazuki has been spotted helping a crusty old farmer and his two children. A wild brawl erupts, where Ikazuki uses his magic to summon the ghost of his father to put the fear into his enemies, then flies around, shoots lasers, rides lighting, causes several detonations, and then uses and eldritch lasso to trounce the bad guys. But before he can take out Yuki-daijo, Orochimaru arrives and evens the field. And when the dust settles, the farmer is dead, his daughter is captured, destined to be added to the brothel back at the castle, and Ikazuki barely escapes with the son. Meanwhile, meanwhile, Sonate, who parted ways with Ikazuki to continue her own quest, has an unfortunate run-in with Zenbei’s goon squad, who think she’s discovered their secret plans. And it is only through the timely arrival of Zenbei himself that prevents her from being killed. Sending the others on to kill Ikazuki, Zenbei sticks with Sonate, hoping to help find her missing dad, because she reminds him of his long lost love, killed as a reluctant spy in a far away land at the insistent behest of her belligerent father. They soon run into Ikazuki and the boy, who isn’t doing so hot after their latest run in with Zenbei’s assassins (-- now numbering about three --) while trying to ford a river. Zenbei is shocked to find out Ikazuki is the boy Sonate’s been mooning over the whole time they’ve been together. He’s also sniffed out who her father is, kidnaps her, leaving our hero to deal with a bunch of killer door panels (-- again, not making that up), and takes her to Orochimaru, who, turns out, as a surprise to probably no one by now, is her father. Seeing this as a golden opportunity, Orochimaru tries to turn Sonate to the Dark Side, commanding his traumatized daughter to go back to Ikazuki and poison him. After a substantial browbeating, she reluctantly agrees to honor his wishes but cannot go through with it in the end -- almost, but not quite. Also of note, having seen this tragic scenario played out before with his own lost lover, Zenbei also has a change of heart and takes out “Plan B," his last assassin, currently hiding outside the window of their current refuge. Together, then, they hatch a plan that requires Zenbei to lure Orochimaru to their hideout and away from the castle so Ikazuki can take out Yuki-daijo without his interfering. 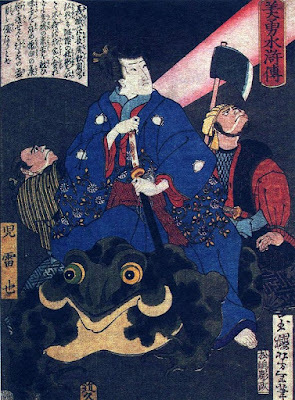 And do this they all do, quite spectacularly, as our hero interrupts the evil lord’s latest round of drunken debauchery by siccing a giant, fire-breathing horny toad on him (-- right before he *ahem* “deflowers the farmer’s daughter), which destroys most of the citadel as it chases all of Yuki-daijo’s men into the sea. But for the man himself, the honor of his death belongs to Ikazuki, who avenges his father most righteously. But suddenly! Orochimaru appears, flying in on a fireball, thanking our hero for clearing the way for him to claim the throne. Seems Zenbei’s last assassin wasn’t as dead as he thought, who spilled the beans about his master and Sonate’s betrayal, which gets Zenbei run through with a sword and Sonate left bound to a post to be dealt with later. 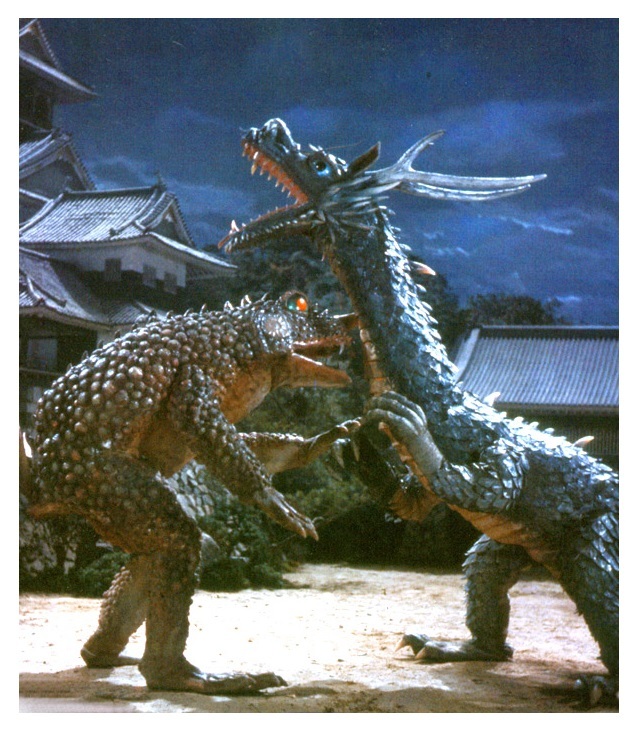 Anyhoo, this all leads us to the climax, which means it is time for a KAIJU BIG BATTLE! Summoning his dragon once more, Orochimaru’s magical totem engages in combat with Ikazuki’s giant toad, exchanging blasts of fire and water, before slamming together for an outright slobber-knocker, laying waste to what is left of the castle and grounds. Again, it appears the more seasoned Orochimaru has the upper hand, whose dragon soon has Ikazuki’s toad on the ropes. Fortunately, Sonate, rescued by the farmer’s son, feels it is time to employ the spider talisman her grandmother gave her way back at the beginning of the movie. Thus, the battle is joined by a giant spider, who goes all larval Mothra and quickly turns the tide against the dragon, which evaporates -- well, detonates, in defeat. This sets up a final, more traditional, samurai showdown between Ikazuki and Orochimaru. Here, is the film’s weakest moment as the running sword fight along the water’s edge is kinda awkwardly staged and ends with Orochimaru having some kind of seizure before collapsing into the sea, where he … transforms into a giant disco ball and explodes? Maybe? Maybe it was his dad? Or the spirits of the men he killed on the boat? Whatever, the bad guy’s dead and Ikazuki didn’t have to kill him, much to the relief of Sonate. Hooray! Then, summoning that giant eagle, Ikazuki and Sonate jump on and fly away, leaving the kingdom and the land to the people, destined to return to the forest where they will live happily ever after together. I think it is the completely demented fairy tale vibe that has always enamored me to The Magic Serpent. Information and background on the film is fairly scarce and sketchy so I can’t really tell you who was responsible for the stunts, F/X, production design, or who was in charge of the giant monster action. 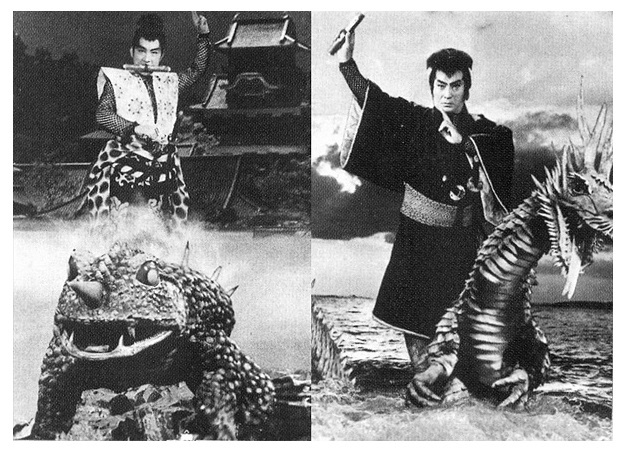 The toad was a man in suit, who belched real fire like Gamera. The dragon was an impressive combination of a monster suit and a glorified marionette. Sure, they kind of pale when stacked up against the work of Tsuburaya, and you can barely NOT see the wires used to animate them, but, again, it is this kind of low-tech effort that I find the most endearing about the whole movie. Also, one should note, this might be a conscious choice to look that way, especially when you take into account they bothered to have an air-bladder in the giant toad so his throat pouch would work. 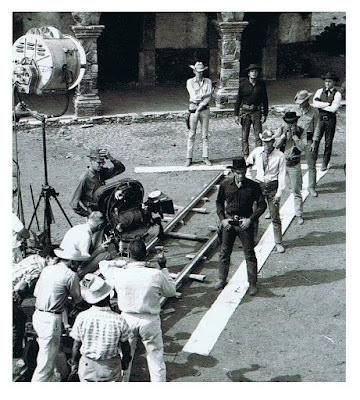 A lot of the F/X were done in camera, with double-exposures and the use of matting in most instances, with still images of our characters flying around on painted in fireballs. Again, I’m sure this was all done with cost-savings in mind, but it resulted in a crazy, live-action manga aesthetic that really draws you in. And most importantly of all, this approach also requires a leap of imagination and a willingness to engage from the audience, to believe in what you are seeing, suspension of disbelief be damned, with any and all cynicism curb-stomped for about 90 odd-minutes, instead of the sensory overload we get today in sci-fi and fantasy films, which is why I picked The Magic Serpent for this particular “For the Kids” roundtable for the Celluloid Zeroes as the perfect entry point for any young and burgeoning genre fans as an introduction to the gonzo world of Japanese tokusatsu. 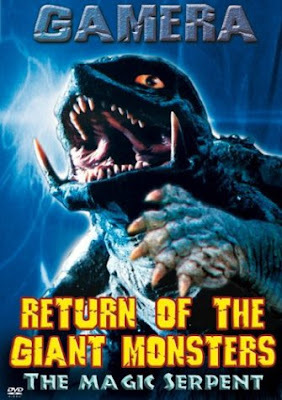 Now, I’m kinda ashamed to admit when I bought Retromedia’s double-feature DVD of Return of the Giant Monsters (Gamera vs. Gaos) and The Magic Serpent many moons ago I got it for the Gamera movie and the Gamera movie alone as it wasn’t until many moons later that, on a whim, I gave the second feature a spin because I was too lazy to swap out the DVD. Well, shame on me, and apologies to myself for taking so damned long. And while I do appreciate the DVD the feature was obviously the AIP-TV print, which still looks pretty good considering how old it is, and it is better than nothing, but it is also cropped in a defensive driving course of pan and scan. There is a dodgy, dubbed widescreen print streaming on YouTube at last check; again, better than nothing, but there are also several widescreen clips floating around both dubbed and subtitled that look ah-mazing that I have thus far been unable to pinpoint a source on and it is driving me bananas. (All the widescreen vidcaps for this review were taken from those clips and the Japanese trailer.) This is a movie screaming to be seen in its original aspect ratio so we may absorb the full impact of all it’s nutty magic. Arrow Video? Vinegar Syndrome? Shout Factory? Someone get on that as soon as possible, please and thank you. Until then, no matter what your age, really, I encourage all of you track down The Magic Serpent as soon as possible if you haven’t seen it yet and rectify yourselves! This review was just one entry in the Collective Head 'o' Knuckle, known in your dimension as The Celluloid Zeroes, latest roundtable efforts. Please follow the linkage to my similarly addicted B-Movie Brethen, won't you? Thank you! Checkpoint: Telstar :: Time Bandits // Web of the Big Damned Spider :: 5000 Fingers of Dr. T // Cinemasochist Apocalypse :: TBD // Psychoplasmics :: The Gate // The Terrible Claw Reviews :: Gamera vs. Viras // Seeker of Schlock :: Spider-Man.